Restores are performed in the background to lessen the impact on your computer's resources. However, the less you use your computer, the faster your restore will complete. You can view the progress of your restoreTo download files from Carbonite’s servers to your computer. through the Restore Manager. Note: If the icon isn't visible, click the show hidden icons button ( < ) next to the Windows notification area to display hidden icons. In Windows 7, click the Show hidden icons button ( ^ ) next to the Windows notification area to display the Carbonite icon. To view the desktop and notification area in Windows 8 and Windows 10, press the Windows Key + D on your keyboard. The Carbonite application will be displayed. Click the View status of files being restored link to open the Restore Manager. Click the image(s) below to enlarge. If you are restoring a large file or a large folder, the Restore Manager will display the progress of the file or folder being restored. 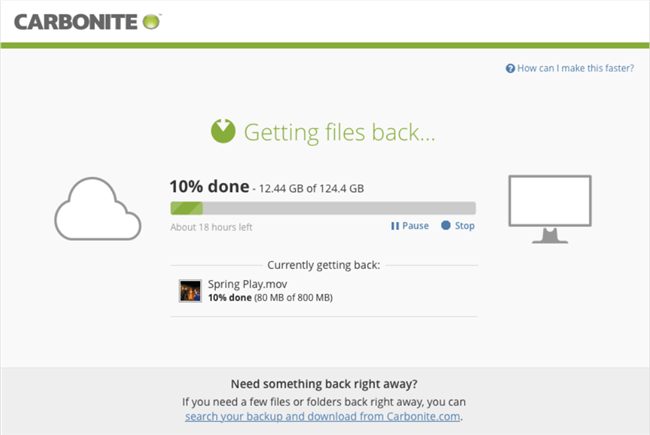 Carbonite restores one file at a time and needs to finish an entire file before moving on to the next one. For example, email files are very large and may take a few hours to restore - even with a high speed internet connection. If your computer restarts or the Internet connection is dropped or otherwise disrupted, Carbonite will need to start restoring the file it left off on from the beginning. 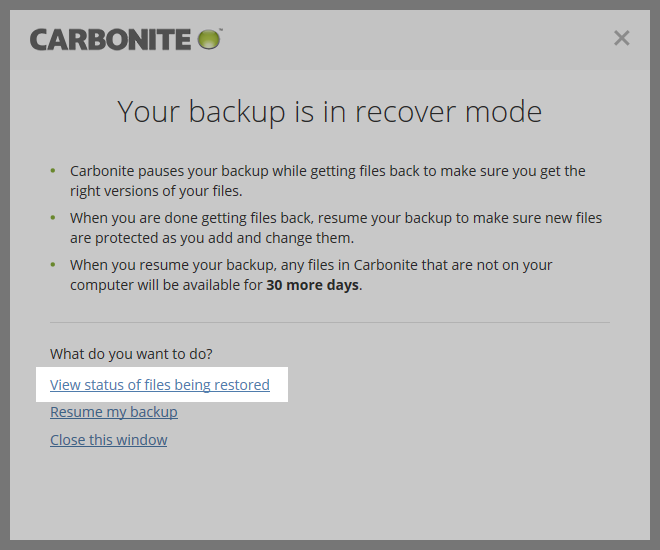 Restoring a large file is not the only reason Carbonite may appear to be stuck. Please see further steps below. Check to make sure Carbonite is in Recover Mode and enable it if not. Stay in Recover Mode until your restore is completed and you are sure you have everything you need. Make sure your computer stays on and awake for the duration of the restore by adjusting your power settings. Make sure Windows Updates are not causing the computer to restart automatically by configuring your Windows Update settings.